"This recipe, adapted to use the traditional flavors of Classico® Pasta Sauce, was originally submitted by Allrecipes home cook Joanie Heger." In a large skillet over medium heat brown the ground beef. Drain the grease. Add pasta sauce and simmer for 5 minutes. To assemble, in the bottom of a 9x13 inch baking dish evenly spread 3/4 cup of the sauce mixture. 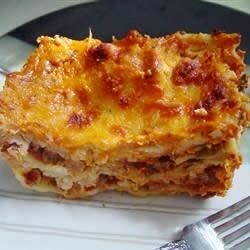 Cover with 3 lasagna noodles, 1 3/4 cup of the cheese mixture, and 1/4 cup sauce. Repeat layers twice. Top with 3 noodles, remaining sauce, remaining mozzarella and Parmesan cheese. Add 1/2 cup water to the edges of the pan. Cover with aluminum foil. See how to make a cheesy 5-star lasagna with ground beef. Very tasty recipe! It was super easy to make. The only change I made was using ricotta instead of cottage cheese. worked fine. kids liked it and it was a little bit quicker than some lasagna recipes. thanks! Delicious! I made this for my family when I was home from college. It's simple and easy, and it turns out GREAT! Super easy to make and my family loves it. I have made this recipe twice now, no adjustments needed. Takes me about 25 mins of prep time though.